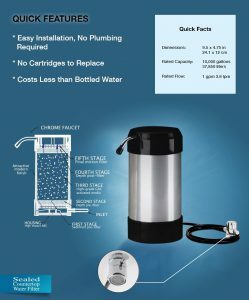 CleanWater4Less, is a countertop drinking water filter which is wholesale and distributed by Lake Industries. They are the international leader in wholesale supply of kitchenware including various water filter system. 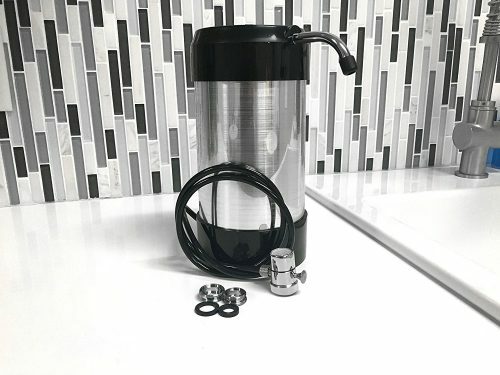 What stands out and caught the attention from the CleanWater4Less countertop water filter is there is no replacement filter needed. The whole canister filter is the filter cartridge which did all the work to filter the dirty source water. 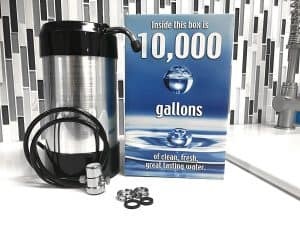 It’s claimed by the company that CleanWater4Less drinking water filter system is able to handle 10,000 gallons which is an incredible amount. It could last for 7 years on average for a family of 4 using 1500 gallons of water per year. CleanWater4Less comprise of a 5 stage filter in the high quality ABS casing. It consists of sediment pre-filter, depth pre-filter, high grade GAC filter, depth post-filter and final micron filter. The main high grade GAC filter removes odor and taste from chlorine, heavy materials, radon and VOC(Volatile Organic Compounds). CleanWater4Less is a light weight water filter which is extremely portable to move around. This filter is sleek and stylist compared to the other product in the market. The installation is relatively simple and required no plumbing skills. Just screw on the faucet adaptor and let it drain for 10-15 minutes and you are good to go. No Annual Replacement Cost is Required.. While most of the countertop drinking water filter required a hefty maintenance cost, the CleanWater4Less doesn’t need any replacement for up to 10,000 gallons of drinking water. There was no warranty stated by Lakeside Industries, the distributor for CleanWater4Less. However, there is a 30 days money back guarantee period which you can try for this product and return it if it is unsatisfactory. There are limited information out in the market regarding this CleanWater4Less drinking water filter. Lakeside Industries are not the manufacturer and did not specifically stated where the product was made. It is not suitable for extreme water conditions such as dirty well water. It is best to be used on city waters that has been treated from water treatment plants by the council. In general, most customer provides great feedback on the CleanWater4Less countertop drinking water filter although it is unbelievable that there is no filter replacement needed. It is RECOMMENDED for people who is on a tight budget while still wish to consume clean water. Check out how CleanWater4Less Countertop Water Filter RANK in the best countertop water filters. Very informative and useful information in this age of water purifiers and bottled water. Would you recommend buying a water purifier over bottled water? Definitely. It is so much cheaper in a long run on investing a water filter.